By praying two simple prayers for the rest of your life. First, our loving God has given every person a guardian angel to help protect them and guide them. Ask your angel to go before the Throne of Almighty God and petition Him to send legions of Holy Angels to terrorists around the world and drive Satan and his fallen angels away from them. Second, pray to God for the softening of hearts and conversion of souls of terrorists throughout the world. Pray for justice. If millions of people pray these two simple prayers daily, our world will change for the better. I send you to the throne of Almighty God. Please petition Him to send legions of Angels to terrorists throughout the world to drive Satan and his fallen angels out of their lives forever. I pray for the terrorists throughout the world. May they have a softening of their hearts and conversion of their soul to You. I pray for justice in myself and in all mankind. 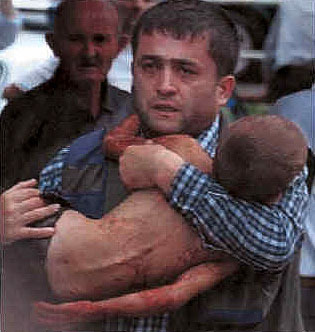 It has been ten years since the world watched in horror, as the school in Beslan, Russia was being attacked by terrorists. Over several days, over 300 mostly children and women were slaughtered. How did we as Christians respond to this horrific event and other acts of terrorism since? Here is how three ministry partners responded.The three ministry friends, Manny, Roseanne, and Jack, discussed how the terrorists had to be under the influence of Satan to be able to slaughter those innocent children. As they saw the photos of parents running out of the buildings with their bloodied children in their arms, one of them said, “That is enough. I am not going to do this anymore. I am tired of being held hostage by terrorists.” The three agreed that there has to be something that good people can do besides buying water and duct tape for safe rooms. There has to be something that we can do besides sending young men and women off into harm’s way. Then, they sat in quiet prayer to the merciful Lord. After about an hour they received an answer. This is what they were inspired to do. Send their guardian angels to the throne of Almighty God and petition Him to send legions of angels to terrorists around the world to drive Satan and his fallen angels away from them forever. Then pray to God for a softening of the terrorist’s hearts and a conversion of their souls. Pray for justice. send goodness around the world. They got their website up and going again and now it is in several languages. Can you imagine if millions of people around the world, petition God to send legions upon legions of Holy Angels every day what a difference it will make? Yes we can make a difference with prayer. As Christians, we have the perfect example with the fall of Communism in Eastern Europe. It fell without a shot being fired. Why? Because our grandparents, our parents and we prayed for it for years. Our prayers can help decrease or maybe even end the horrible violence of terrorism. Prayer can change the world.